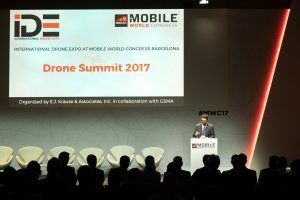 The International Drone Expo (IDE) held its successful debut in continental Europe at the Mobile World Congress 2017 in Barcelona, Spain. The summit was organised by E.J. 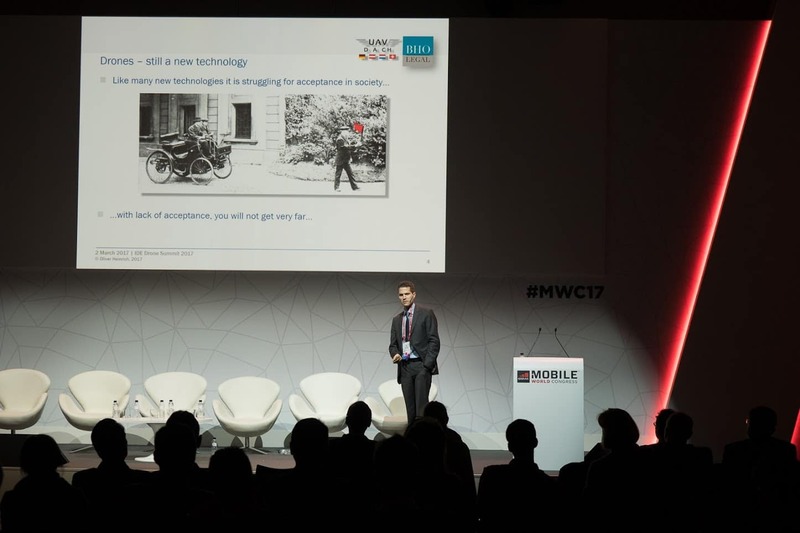 Krause & Associates in collaboration with GSMA, the organiser of the MWC. 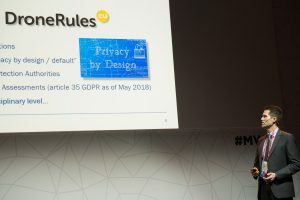 While already well established in the United States, this year was the first time the event took place in Europe, where it was received by an interested audience of over 250. Mike Rosenberg, Senior VP of E.J. Krause & Associates and his team put together a programme of presentations and panel discussion which aptly combined the future developments of the world of mobile communications with hot topics of rapidly developing drone market. Under the experienced moderation of Mike Rosenberg the audience learnt first-hand of experts from telecommunication giants like Deutsche Telekom, and Telefonica how the new 5G technology could be used to establish a traffic management system for unmanned aircraft (UTM) but also about the limitations of such technology with its initial focus on ground based communications. The host region of Barcelona presented its approach of integrating drone technology into its infrastructure to benefit a number of established and also completely new undertakings. Barcelona’s highly acclaimed drone test centre was also presented. As one of only ten test sites in the world, the centre allows for tests and trials of new drone technology under real world conditions but without many of the otherwise limiting regulatory restrictions. The presentations of drone manufacturers Microdrones of Germany and world market leader DJI, China, provided exiting insights into professional use cases for drones, especially with DJI hitting the market for professional applications in force. The presentation by DHL on its incredible progress for drone applications in the logistics area gave an impressive demonstration that Europe is not at all behind the developments in the US from logistic giants like Amazon. AT&T from the US with its demonstration of a flying COW (Cell On Wings) showed that drone technology can provide unprecedented new possibilities for quickly establishing a mobile communications network e.g. in disaster areas where communication is key to coordinate rescue efforts and save lives. IDE also touched on the crucial issue of privacy and data protection. As a topic of our time and with the technical possibilities to collect large amounts of data, the public is greatly concerned about the way drones are being used. Raising awareness for this sensitive topic, the presentation from BHO Legal also provided ideas how the issue could be approached for achieving the public acceptance needed to develop the young market into its full potential. With the great response of this initial European Drone Summit it is only natural that the event will return to the MWC in 2018. Given the incredibly quick development of the market and also the active regulatory activity and many pending technical, social and legal issues, it can be expected that the event will continue to grow in the future. The IDE Drone Summit Europe will definitely be worth a visit. To view the official IDE report, please click here.